Remember the 80s? Or are you a 90s clubber? Wow - what a fantastic fitness challenge! Whether you remember the 80s and 90s or if you're just into keep fit, Back To The Fitness is the event for you. Sunday 3 February sees a two hour Zumbathon challenge with an eighties flavour, so dig out those leg warmers! Fluorescent head and wrist bands are included in the entry fee, and we can't wait to see hundreds of you showing off your best Zumba moves. It's a great aerobic workout, burning up to 600 calories per hour, so a fantastic way to kick off your fitness routine and get back into shape for Spring. Starting sharp at 10am, this fun challenge finishes at 12 noon. And we're continuing through the decades in the afternoon with a 90s Clubberthon challenge! Yes, if you're missing the music of Fatboy Slim, Basement Jaxx, Spiller and all the classic sounds then come along and relive those days (and nights). For this event, we're including glow sticks in the fee, and we're hoping to recreate the atmosphere of a 90s club. 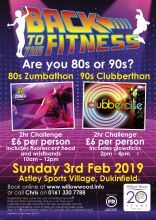 Both the Zumbathon and Clubberthon will take place at Astley Sports Village, Dukinfield. There's plenty of free parking, and anyone over the age of 11 can take part in one or both events, although all under 14s must be with an adult who is also taking part. Registration is £6 for the Zumbathon and £6 for the Clubberthon. But if you're superfit and really up for a challenge do both for the special price of just £10! And we've even got a special, limited edition T shirt too! Why not really look the part - order now!